# Dice the rinds finely. # Put so much water in a pot and boil, and then add the rinds in it. Drain after boiling for 10 minutes. # Fill water into the same pot again and boil the drained rinds for 10 minutes again. Repeat this act for about 3-4 times for getting the rinds bad taste away. 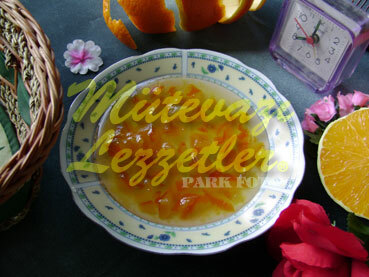 # Put the orange juice and the diced rinds into another pot, and boil them for 45 minutes over low heat together. # Finally add lemon juice and boil for more 5 minutes, and then take form the stove. # Cover the lid and let it stand for cooling down, and then fill into the jars. Note: There are some other ways for cooking this jam, but there is nearly no waste while cooking by this recipe.